'Siberian Chiffchaff' Phylloscopus collybita tristis: discussion and photo gallery. Dean, A., Bradshaw, C., Martin, J., Stoddart, A. & Walbridge, G. 2010. The status in Britain of 'Siberian Chiffchaff'. British Birds 103: 320-338. 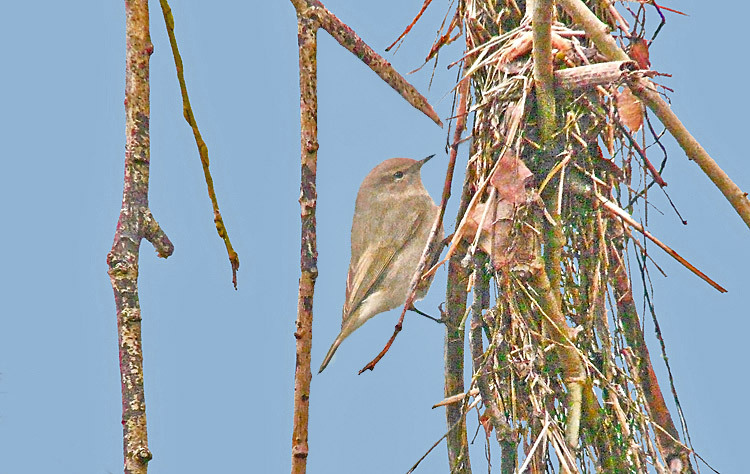 The taxonomy and diagnosis of ‘Siberian Chiffchaff’ have long been beset by confusion and divided opinion, with considerable uncertainty surrounding both its systematic and morphological limits. Investigations based upon mitochondrial DNA (mtDNA) confirmed 'genetic distance' between the currently designated forms within the chiffchaff complex and helped to clarify species boundaries. However, whether tristis warranted recognition as a distinct species remained inconclusive (Helbig et al. 1996). For many years, the origins of variation in the appearance of Chiffchaffs in the west of the range of tristis were contentious, attributed variously to hybridization between tristis and abietinus or to individual, clinal and even taxon-level variation. Initial genetic studies were confined to mtDNA, which is inherited solely via the female line, and also led to differing interpretations. Marova et al. (2009, 2013) concluded that hybridization was widespread in the region of sympatry while studies of migrants in the Netherlands by de Knijff et al. (2012) led to suggestions that the plumage of tristis was naturally more varied than had been implied hitherto. 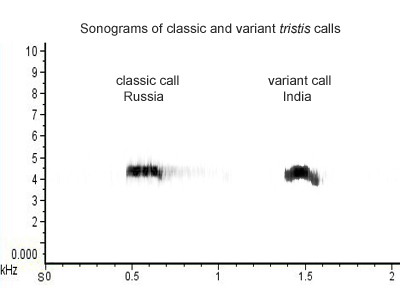 The extent to which vocalisations are diagnostic is also constrained by the issues of call variation within all taxa, hybridization with abietinus and the very tristis-like calls given by forms of Chiffchaff found in the Middle East and the Caucasus. More recently, techniques for examining 'whole genome sequence data' have been developed and applied to Chiffchaffs in the zone of sympatry between tristis and abietinus in the Urals region (Shipilina et al. 2017). As a result, unequivocal data is emerging on genetic origins and plumage variation. Significant genetic mixing between tristis and abietinus has been confirmed. It has been identified as 'the driving force underlying trait variation' and has also been implicated in vocal anomalies. The following pages explore the issues and their implications for field identification of 'Siberian Chiffchaff'. The complete text is inevitably lengthy. For subsequent reference, a Summary is included, which provides a résumé of key issues. Any text discussing the appearance of Chiffchaffs is immediately beset by the issue of colour nomenclature. Several colours and shades - olive, yellow, brown, buff, grey and white - are exhibited by most Chiffchaffs to one degree or another. For 'classic' individuals of the various taxa, it is the extent and intensity of these key hues and the degree to which they are admixed that lead to a characteristic appearance (what might be termed 'a central tendency'). Certain individuals which currently defy easy diagnosis also 'stand out from the crowd' largely because they exhibit an evidently anomalous balance of these key 'colours'. Hence, colour nuances are central to discussions of plumage traits in Chiffchaffs and inevitably figure prominently in the following text. However, the absence of a universally recognised and accepted 'colour nomenclature' adds yet further complexity to discussions of plumage colours and differences. Indeed, different observers often apply contradictory colour names to the same individual Chiffchaff while, conversely, identical colour names are often applied to two or more Chiffchaffs of quite different appearance. When discussing Chiffchaffs, it is near-impossible to avoid using the terms 'grey' and 'buff' but both of these suffer from especially diverse interpretations between different observers and this can and does lead to ambiguity and confusion. In my own texts, I employ shorthand terms for certain colour liveries, such as 'olive and yellow', 'brown and buff' and 'grey and white'. Clearly, there is nothing very 'nuanced' about these terms and they are no more than labels of convenience. They are relative, not absolute terms, designed to indicate the key colours and shades which distinguish the Chiffchaffs to which they are applied. In a wider context, 'grey' can span any shade between white and black, as in the 'Kodak Grey Scale' below. In the term 'grey and white' livery, the label 'grey' is intended to convey a prominence of a 'stony grey' shade (nomenclature again!). It denotes a shade resembling 'pale neutral grey' in Smithe's 'Naturalist's Color Guide' or shades in the range 2 to 4 on the Kodak Grey Scale i.e. similar to or a little darker than the outer borders to the scale in the image below). 'Buff' is here used to designate the hue which infuses the breast and flanks of a truly 'classic' Siberian Chiffchaff. In this usage it lacks yellow and has a slightly 'rusty' tinge (in more detailed discussions in the text, the term 'rusty-buff' is often employed). Thus, it signifies a somewhat warmer shade than is sometimes inferred by the term 'buff'. ● It essential that all these shorthand terms are interpreted with reference to the definitive and carefully chosen photographs from which they derive their meaning (see Plate 1 below). 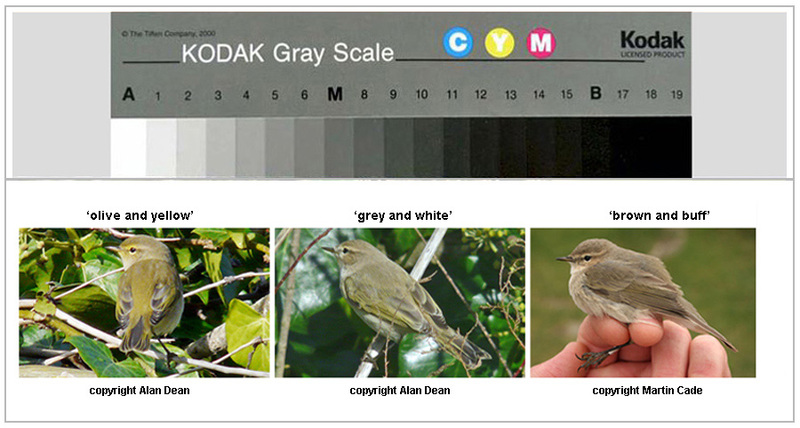 As the applicability of the description 'grey' is interminably debated, it is worth noting here that HSB analysis of screen portrayals shows that the mantle colour of both the 'grey and white' Chiffchaff and the classic tristis in Plate 1 have a much higher grey content than that of the 'olive and yellow' collybita. The collybita and the 'grey and white' combine (different) shades of olive with neutral grey, with olive dominant in the former but grey dominant in the latter. The tristis lacks olive in its mantle hue and combines russet with neutral grey, which produces its distinctive 'tan brown' appearance. Plate 1. A typical 'olive and yellow' collybita on the left, a typical 'brown and buff' tristis on the right and a 'grey and white' Chiffchaff in the centre (taxon much debated - see Casestudy1). Classic 'brown-and-buff' tristis lack olive and yellow in the body plumage (apart from yellow on the underwing coverts) while classic 'grey-and-white' Chiffchaffs lack the distinctive tan-brown and rusty-buff hues characteristic of classic tristis (see main text for further discussion and nuances). Chiffchaff plumages as a whole encompass a somewhat 'sliding scale' but terms such as 'brown-and-buff' and 'grey-and-white' are convenient 'shorthand' and encapsulate the relative 'colour balance' differences of archetypal forms. The image above provides a reference for the application of these terms in the texts on this site. A 'pixel map' from the mantle of each of the three Chiffchaff images above can be seen in Colour issues and photographs. The Common Chiffchaff Phylloscopus collybita has a broad distribution across Europe and east to Siberia, with six subspecies currently recognised by most authorities. Broadly speaking, the nominate form collybita of western Europe is replaced by abietinus in eastern Europe and by tristis in Siberia. From further south in Europe, in Turkey and in Central Asia brevirostris, caucasicus and menzbieri have been described. The ‘chiffchaff complex’ is completed by four further closely-related species of southerly distribution: Iberian Chiffchaff P. ibericus, Canary Islands Chiffchaff P. canariensis, Mountain Chiffchaff P. sindianus and Caucasian Chiffchaff P. lorenzii (until recently treated as a subspecies of sindianus). Chiffchaff plumages vary individually and there is a degree of clinal variation, with a diminution of olive and yellow from west to east. The taxonomy and identification of the ‘chiffchaff complex’ was discussed by Clement, Helbig and Small (1998). In 2005, Dean & Svensson discussed in detail the taxonomic and plumage limits of tristis, describing the appearance of 'classic' tristis and also discussing the issue of 'fulvescens' from the West Siberian Plain. East of the Yenisey, classic individuals from the core-range of tristis are reasonably consistent in appearance. Naturally, there is a degree of individual variation (as with all Chiffchaff taxa), with some individuals rather paler and some rather darker, but - contra some assertions - such classic tristis are not especially pale, apart from rather white central underparts. They can, however, appear rather 'monotone' or 'colourless' to observers for whom nominate collybita (with its prominent olive and yellow hues) is the norm. The type description of tristis (Blyth 1843) can be examined in Appendix 1 but the most frequently-cited reference to the plumage of such classic tristis is the description provided by Svensson (1992). Classic tristis (see Plate 2) lack yellow entirely away from the underwing coverts, the axillaries and the marginal coverts near the bend of the wing, and lack olive on the crown and mantle. The upperparts have a characteristic hue of grey-brown while the underparts are off-white, with a rich buff suffusion of variable extent on the breast and flanks. Rich buff also infuses the supercilium and the ear-coverts, where it can assume a rusty-buff hue. In fresh plumage, the remiges and rectrices have subdued olive margins while the scapulars, lower back and rump may show limited olive streaking. However, in classic tristis such olive tinges are rarely visible in the field. The bare parts are somewhat less consistent in appearance but many individuals have a relatively slight bill which is predominantly black while the legs and upper surface of the feet are also quite intensely black. The deficiency of yellow and olive has become regarded as the 'defining' characteristic of tristis. However, equally characteristic are the brown component in the hue of the upperparts (which generally has a small but influential russet component which, at its most distinctive, produces a 'tan' or 'khaki' tinge - see HSB analyses) and the rich buff wash to the supercilium, cheeks and sides of the breast and flanks. Any Chiffchaff which lacks these 'tan' and 'buff' hues entirely is unlikely to be tristis. The plumage of east Siberian tristis recalls that of Caucasian Chiffchaff P. lorenzii, though the latter has even more subdued olive fringes to the flight feathers, a darker crown and a whiter and more striking supercilium, which frequently bridges the forehead. Plate 2. Two 'classic' Siberian Chiffchaffs Phylloscopus (collybita) tristis. Classic tristis are relatively 'colourless' or 'monotone' rather than truly pale (as is often inferred). They lack yellow away from the bend of the wing and lack olive in the crown and mantle. Additionally, they have a characteristic tan-brown hue to the upperparts and a rich buff suffusion to supercilium, ear-coverts, sides of breast and flanks. West of the Yenisey, the appearance of Chiffchaffs is less consistent. Sushkin (1925) and other Russian authors designated Chiffchaffs from the region west of the Yenisey as fulvescens, primarily on the basis of brighter olive on the rump and the fringes to the remiges compared with classic tristis (rather than any 'additional' yellow). Ticehurst suggested that individuals with such olive enhancements were to be found throughout the range (not just the west) and consequently questioned the taxonomic validity of 'fulvescens'. The name 'fulvescens' derives from the type description of Severtzov (1873), which was based on a series of migrants collected in Turkestan (so their natal origins were uncertain). See Appendix 1 for a transcription of the type description (kindly provided and translated by Dr Vladimir Loskot, Curator of the Ornithological Department, Zoological Institute, Russian Academy of Sciences, St. Petersburg). Despite ambiguities arising from linguistics and colour nomenclature, the type description implies the presence of 'additional' yellow compared with 'classic' tristis, as well as mentioning olive fringes to rectrices, remiges and wing-coverts. Svensson (1992) wrote that some individuals in the region west of the Yenisey match the ‘classic’ birds from further east but others have traces of yellow on the underparts, the supercilium and often on the upper part of the eyering, and traces of olive in the crown and mantle. It is in this sense that the name 'fulvescens' has become most-widely applied in more recent literature i.e. individuals between the Urals and the Yenisey which match classic tristis closely apart from traces of 'additional' or 'misplaced' yellow and olive, with 'additional' yellow becoming the principally cited character. to the upper eye-ring, prominent yellowish-olive fringes to remiges and perhaps the extent of the pale base to the bill are all 'fulvescens' traits. Compare this individual carefully with those in Plate 2. Full details of the Powick indivdual, and a more 'classic' individual also present at the site, can be found on Andrew Warr's blog <here>. distinct yellow tinge in upper eye-ring of the Powick individual (and evident yellowish-olive fringes in the visible 'shoulder' area). The origin and even distribution of 'fulvescens'-style Chiffchaffs have been the subject of debate for many years. A long-standing opinion is that traces of 'enhanced'' or 'misplaced' olive and yellow arise from introgression from abietinus, as the ranges of the two forms are contiguous and, indeed, overlap in an area west from the Urals. Under this scenario, 'fulvescens' has been considered at times as a 'hybrid race arising from secondary intergradation between typical tristis and abietinus' (but the concept of a 'hybrid race' is problematic - see Marova et al. 2017 and 'Geographical variation' in the Chiffchaff text in BWP6). Discussions of introgression, hybridization and character variation have been hampered to some extent by a widespread tendency to apply the name 'fulvescens' indiscriminately to all Chiffchaffs differing from 'classic' tristis, whether from the allopatric West Siberian Plain or from the region of sympatry around the Urals (see Appendix 3 for consideration of this issue and the names 'fulvescens' and 'riphaeus'). Where the ranges of tristis and abietinus are sympatric, in a 1500km long corridor extending from the southern Urals to the Archangelsk region, plumages are encountered which are morphologically intermediate between classic tristis and abietinus. Such intermediate-looking individuals were designated as riphaeus by Snigirewski, and originally regarded as a valid taxon, but they were subsequently equated with hybrids between tristis and abietinus (Snigirewski 1931) and later also by Ticehurst (1938) - see Appendix 3. The question of hybridization in the zone of sympatry between tristis and abietinus, extending north and west from the southern Urals, was investigated extensively by Marova et al. (1993 et seq.). Using a combination of morphological, vocal and mtDNA data, they concluded that hybridization between the two taxa was extensive, in a region from the southern Urals north to the Kanin Peninsula. They reported an imbalance in gene flow, however, with 88.5% of the individuals they deemed to be hybrids carrying the mtDNA haplotype of tristis. Subsequent genetic research by de Knijff et al. (2012) was based on a sample of 41 individuals trapped in the Netherlands during late-autumn and winter. Among their sample, the authors found the mtDNA haplotype of tristis not just in individuals identified in the field as tristis but in any individual which did not suggest nominate collybita. In particular, they found that Chiffchaffs diagnosed by their ringers as abietinus invariably carried a tristis haplotype (i.e. they found no abietinus haplotypes at all). As they pre-selected Chiffchaffs deemed to appear 'non-collybita-like' in appearance and their sampling period was based on late autumn and winter, it remains possible that abietinus were missed (many abietinus are close in appearance to collybita). However, in an unpublished study, Greg Conway and Staffan Bensch also found a dearth of abieitnus, even though their sampling was non-selective. The data from de Knijff et al. received much publicity. The absence of abietinus haplotypes indicated that - contra prevailing presumptions - abietinus was rare as a migrant through western Europe. Additionally, it was proposed that plumage limits in tristis were much wider than traditionally supposed. At an extreme, it was suggested that any Chiffchaff which did not resemble nominate collybita could now be ascribed to tristis, including individuals which lack key plumage features traditionally associated with the form. What is now clear from these reactions is that prevailing ideas about the plumage limits and the extralimital status of abietinus are just as capricious as those relating to tristis. In their study, de Knijff et al. did not discuss the findings of Marova et al. : i.e. they did not consider the issues of 'fulvescens', 'riphaeus' or hybridization. Implicitly, an assumption was made that Chiffchaffs bearing tristis mtDNA could be diagnosed as thoroughbred tristis. Some authors inferred that hybridization was not an issue, suggesting that it was rare 'if it occurred at all' (van den Berg et al. 2009). Since mtDNA cannot identify hybrids directly (being inherited only from the maternal side), resolution of these differences of opinion depended upon the development of techniques for examining the nuclear DNA of the forms. This proved elusive for several years but, in 2017, Shipilina et al. published a much-needed study, extending the earlier studies of Marova et al. to include 'whole genome sequence data'. This study confirmed that chiffchaffs within the sympatric region have 'a mix of genetic ancestry indicating extensive ongoing and past gene flow'. Mismatches between phenotype ('appearance') and haplotype (mtDNA) were found only in the sympatric region and not among individuals from allopatric regions. The authors concluded that natural plumage variation among thoroughbred tristis is limited, that ‘genetic admixture is the driving force underlying trait variation in the sympatric region’ and that intermediate-looking individuals are hybrids. More disconcertingly still, it was reported that individuals with 'pure morphotoype' (e.g. matching tristis appearance) and with the corresponding mtDNA (e.g. also with tristis mtDNA) could still contain a significant proportion of 'foreign' alleles (e.g. tristis morphotype and tristis mtDNA but with a proportion of abietinus alleles). It was inferred that even traces of misplaced yellow found in individuals in the West Siberian Plain, east of the sympatric region, are a result of ‘fractional’ introgression of abietinus alleles. As, within the Chiffchaff's breeding range, specimens with abietinus phenotype but tristis haplotype were found exclusively in the contact zone and not in any allopatric populations, Marova et al. (2017) concluded in a subsequent paper : 'We assume that all specimens with mismatching phenotype and mtDNA – including those caught in the Netherlands – are of hybrid origin'. After much claim and counter-claim, Shipilina et al. have provided welcome clarification of the origins of morphological variation observed among tristis candidates. The taxa tristis and abietinus hybridize extensively in the sympatric region and genetic admixture is the principal origin of Chiffchaffs which deviate in appearance from 'classic' individuals. What are the implications of the latest genetic results for field identification of Siberian Chiffchaff? It seems that both appearance and vocalisations are controlled by a limited area of the genome, so that even an individual with the appearance and song of tristis may yet harbour ‘foreign alleles’. The paper notes that: ‘analysis of genomic composition of birds within the sympatric zone showed that several individuals express diagnostic plumage characters and perform diagnostic song despite harbouring the foreign mtDNA type and/or a considerable proportion of foreign nuclear alleles’. Full trait data were available for only a limited sample but indicated that abietinus morphotypes carrying tristis mtDNA were significantly more numerous than tristis morphotypes carrying abietinus mtDNA (among mixed populations studied by Marova et al. (2017), 56.7% of abietinus phenotypes c.f. 4% of tristis phenotypes harboured a contrary mtDNA haplotype). Despite this imbalance, Marova et al. (2009, 2013) reported an individual with tristis morphotype and tristis song yet carrying abietinus mtDNA. These statistics on mtDNA mismatches have been interpreted as implying that a Chiffchaff which ‘looks like’ tristis and 'sounds like' tristis has a reasonably high probability of actually being a thoroughbred tristis (to quote informal comments on the web, following Martin Collinson's alert on the paper by Shipilina et al.). However, this overlooks the finding by Shipilina et al. that even individuals with matching morphotype (appearance) and mtDNA may yet harbour 'a significant number of foreign alleles' i.e. the nuclear genes are mixed. What the findings of Shipilina et al. indicate is that a Chiffchaff which ‘looks like’ tristis has a reasonably high probability of having tristis mtDNA - but it may still harbour a proportion of abietinus genes. Also, in practice, in the field, matching morphotype and mtDNA begs the question of what is meant by ‘looks like tristis’? In the context of the paper by Shipilina et al., ‘looks like tristis’ means an absolute absence of misplaced yellow (as per the original ‘Svensson criteria’). Unfortunately, a complete absence of such yellow can only be guaranteed by examination in the hand. For this reason, the Swedish RC, for example, at one time would accept only trapped individuals. In the field it is impossible to confirm an absolute absence of misplaced yellow (or olive). Similarly, what is meant by 'sounds like tristis'? While careful examination of sonograms will reveal 'mixed' singers, in the field 'mixed' song can be very difficult to distinguish from standard tristis song (Marova et al. 2013; & pers obs), with the more varied tristis-style notes determining the overall character of the song and readily masking interspersed abietinus notes. Compounding the practical difficulties, in the studies by Marova et al. and Shipilina et al., pure tristis song was relatively frequent among individuals with 'intermediate' appearance (i.e. with some yellow streaking), which may be assessed as 'looks like tristis' in the field, while individuals with 'pure' tristis morphotype (determined in the hand) were frequently 'mixed singers'. These studies did not involve call but van den Berg et al. (2009) reported that tristis-style Chiffchaffs encountered on migration in Kazakhstan exhibited 'wide plumage variation' yet called and sang exclusively like tristis. This was interpreted as indicating extensive plumage variation among thoroughbred tristis but the findings of Shipilina et al. indicate a rather different interpretation : that 'wide plumage variation' was a sign of genetic admixture and that hybrids may call (as well as sing) like tristis. Shipilina et al. (2017) suggested that their results brought into question the feasibility of identifying abietinus and tristis on the basis of appearance. So, do we return to an approach which disbars field identification completely or even demand 'whole genome' sequencing of candidate tristis? I am no geneticist but I would argue not. While the level of genetic mixing in the sympatric zone around the Urals (colloquially dubbed the ‘riphaeus’ zone - see Appendix 3) is relatively high, the level of introgression among individuals with trace levels of yellow found in the allopatric West Siberian Plain (dubbed the ‘fulvescens’ zone sensu stricto) is likely to be low (‘fractional’ to use the word employed subsequently in the Shipilina et al. paper). Individuals with such 'fractional' introgression from the allopatric West Siberian Plain surely remain designated reasonably as Siberian Chiffchaffs - see 'Explanatory note' below. The criteria adopted by the BBRC’s ‘tristis panel’ in 2008 were described in detail by Stoddart (British Birds, 2008, 101: 165-166) and Dean et al (British Birds, 2010, 103: 320-338) and reflect this interpretation. The identification criteria they recommended were formulated in 2008 (nine years prior to the 'whole genome' findings of Shipilina et al.) but the panel concluded that individuals which matched the ‘Svensson criteria’ under close and careful scrutiny in the field were acceptable, thus accommodating the likelihood that, if examined in the hand (or in high resolution digital photos), some would reveal marginal 'fulvescens' traits (sensu stricto). However, individuals with field-evident levels of yellow were excluded by the panel’s criteria, as their origins were uncertain and could well include hybrids from the sympatric region around the Urals. It was recognised that some hybrids from the sympatric zone would overlap in appearance with those from the allopatric zone exhibiting just trace levels of yellow but a ‘pragmatic’ approach to field identification was advocated. The panel’s criteria were pragmatic but exacting and explicitly excluded individuals with field-evident levels of misplaced yellow and olive, which places them on the wrong side of the 'riphaeus' line. Also excluded were the still-contentious ‘grey and white Bonelli’s-like’ Chiffchaffs, which not only have traces of yellow but also lack the characteristic ‘tan-brown and buff’ hues of classic tristis. There was an implicit assumption in the tristis panel's criteria that individuals from the sympatric zone with ‘pure’ tristis morphology would be invariably thoroughbreds. This is now known to be false (Shipilina et al. 2017). The evident proviso for the 'pragmatic' approach advocated by the panel is that the majority of tristis candidates reaching the UK and western Europe originates from the West Siberian Plain (or even beyond the Yenisey) and a relatively small proportion originates from the zone of sympatry and hybridisation. This remains to be confirmed and I have argued elsewhere (Dean 2013) that, as the sympatric zone is the nearest potential source of tristis-types to western Europe, it conceivably provides a higher proportion of individuals than regions further east. Whole genome sequencing of tristis candidates reaching western Europe is a prime requirement. In the interim, it would seem advisable to apply the phrase 'showing the characters of Siberian Chiffchaff' to records of individuals identified solely on the basis of field observations. What is not desirable, certainly, is to abandon any attempt to classify and document Chiffchaffs reaching western Europe from the Urals and Siberia. 'Relaxed criteria', embracing putative 'Siberian Chiffchaffs' with field-evident levels of misplaced yellow and olive (for which some have argued in recent years, e.g. van den Berg 2009) or with conflicting vocalisations, must remain excluded. Needless-to-say, such 'anomalous' Chiffchaffs still 'have a story to tell' and should be documented and not ignored. Potential problems with colour fidelity and artefacts in digital images are discussed in Colour issues and photographs. Given the breeding distribution of abietinus in Scandinavia, it would be expected a priori to reach the UK and western Europe regularly on migration and this has long been the assumption. Thus far, however, genetic analyses of Chiffchaffs have failed to find more than a handful carrying abietinus mtDNA. As such genetic testing has been biased towards non-collybita-like individuals, it remains possible that abietinus have simply been overlooked for genetic testing, as many will appear indistinguishable in the field from collybita. However, unbiased sampling of Chiffchaffs wintering in SW England (Greg Conway & Staffan Bensch, unpublished) also found a dearth of abietinus. Further, the data in Shipilina et al. suggest that conflicting morphotype and mtDNA are more common among abietinus morphotypes than with tristis morphotypes (though, again, the proportion which might reach the UK and western Europe from the hybrid zone is unknown and might be presumed to be relatively low). The identification of abietinus away from the breeding range remains challenging, at best, though my own opinion is genuinely 'grey and white' aspects to the plumage can be a pointer to abietinus origins in some individuals (see Plumage limits below). [Explanatory note. A key issue in validating the tristis panel's approach is : ‘what level of introgression is acceptable in the definition of any given taxon?’. This is an issue which is not addressed by the series of papers on Chiffchaff genetics. I am not sufficiently qualified in genetics to answer this question authoritatively but some thoughts follow. More divisive still than tristis-like individuals with marginal 'fulvescens' traits is the identity of Chiffchaffs which, while 'deficient' in olive and yellow, also lack the characteristic 'brown and buff' hues of tristis. In particular, 'grey-and-white Bonelli's-like' Chiffchaffs have attracted extensive debate. This issue is considered in detail below. Despite the provisos described above, typical Siberian Chiffchaffs, with a combination of the characteristic hues of 'brown and buff' and sufficiently limited levels of olive and yellow, are reasonably distinctive (Plate 2 & Gallery). 'Classic' tristis (as found in the heart of Siberia) and individuals which differ from them only marginally (with very restricted 'additional' olive and yellow) do not invite confusion with typical abietinus. Some individuals which closely resemble 'classic' tristis may yet harbour 'abietinus alleles' and non-invasive (field) criteria cannot be failsafe. However, pragmatic identification criteria (as outlined above) will correctly identify an overwhelming majority of 'Siberian Chiffchaffs' originating in eastern Siberia and the West Siberian Plain. What is the identity of Chiffchaffs which not only exhibit rather limited levels of yellow and olive but also lack the characteristic 'tan-brown and buff' hues of tristis? At their most distinctive, they resemble an Eastern Bonelli's Warbler P. orientalis whereas true tristis resemble Mountain (Caucasian) Chiffchaff P. lorenzii. Such 'grey and white' Chiffchaffs have created even more discussion and controversy than Chiffchaffs with 'fulvescens' traits. In the past, such individuals have also been claimed to be within the plumage range of tristis. As they generally have traces of 'misplaced' yellow (and olive) as well as lacking the characteristic 'brown and buff' hues of tristis, this is no longer tenable, following the findings of Shipilina et al. - that thoroughbred tristis has a consistent appearance and that variation from this appearance is a result of genetic admixture. So, are such individuals hybrids or are they variants of abietinus or do they have some other origin? Examination of museum specimens demonstrates that many abietinus are very similar to nominate collybita. Both Ticehurst (in A Systematic Review of the Genus Phylloscopus, 1938) and Svensson (in Identification Guide to European Passerines, 1992), emphasised their similarity. By implication, many individuals will be impossible to separate from collybita in the field. However, both authors also noted variability in abietinus, with Ticehurst describing the extremes of collybita and abietinus as 'very distinct'. Svensson noted that the upperparts of abietinus average a little less olive and slightly greyer, while the underparts are a little less yellow. Individuals in the east of the range he described as displaying more grey and buff and individuals in the NE as sometimes paler overall and with whiter underparts. Such paler and greyer examples of abietinus are not typical but, as they exhibit reduced levels of olive and yellow, they have created historical confusion with tristis. Careful and prolonged examination in varying light conditions confirms that these grey-and-white Bonelli's-like Chiffchaffs lack entirely the characteristic 'brown and buff' hues, with their distinctive tan or rusty tinges, which characterise tristis. Additionally, they tend to have a tinge of yellow infusing the white (not buff) ground-colour of the upper eyering, with the ground colour paler than the adjoining supercilium. Hence the upper eyering is distinct and contrasting, unlike 'classic' tristis in which the upper eyering tends to be of similar hue to - and to merge with - the adjoining supercilium (though it is often more apparent in 'fulvescens' types). Yet they also exhibit reduced olive and yellow in their body plumage compared with many abietinus and all collybita, though there are often relatively bright and contrasting yellowish-olive fringes to the remiges and rectrices. (For further comments and validation of colour nomenclature see Introductory comment on colour nomenclature and HSB analyses). Three examples of such 'grey and white' Chiffchaffs are shown in Plate 5 : one was trapped and photographed in the hand by Gary Crittenden in Highland in November 2008; the second I photographed on St Agnes, Scilly, in October 2011; the third was photographed by Martyn Pitt at Belvide Reservoir in Staffs, in December 2012. While there are subtle differences between them, all three exhibit fundamentally the same livery. On October 28th 2011, the St Agnes individual gave a typical abietinus/collybita call (pers obs), while the Staffs individual gave a 'quiet collybita style call throughout its stay' from December 1st - 3rd 2012 (per Steve Nuttall). Plate 5. 'Grey and white' Chiffchaffs P. collybita. In their basic appearance, such 'grey and white' Chiffchaffs do not at all recall Mountain (aka Caucasian) Chiffchaff P. lorenzii (as do core-range tristis). In fact. apart from rump, face-pattern and bare parts, they are rather reminiscent of Eastern Bonelli’s Warbler P. orientalis. 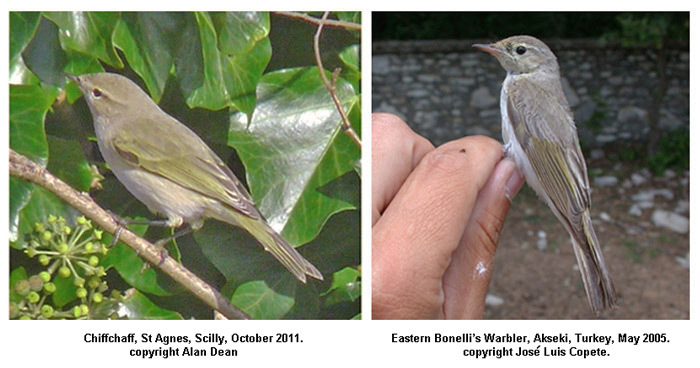 In Plate 6, the 'grey and white' Chiffchaff on St Agnes, Scilly, in October 2011 is compared with an Eastern Bonelli's Warbler in Turkey, photographed in the hand by José Luis Copete. Such individuals are infrequent in the UK but, when they do occur, their distinctive livery invariably provokes comment from those for whom nominate collybita is the norm. In plates 7 & 8, three different images of the St Agnes Chiffchaff are shown above images of Chiffchaffs photographed in Sweden (© Lars Svensson), Finland (© Petteri Lehikoinen) and Estonia (© Ukuu Paal), respectively. The image from Sweden is reproduced from plate 240 in 'Siberian Chiffchaff revisited' (Dean & Svensson, 2005). The image from Finland is reproduced with permission from plate 4 in Copete. J. L. & López, F. 2013. 'Identificatiön de subespecies en el Mosquitero Comün (Phylloscopus collybita collybita, P. c. abietinus, P. c. tristis, P. c. brevirostris, P. c. caucasicus y P. c. menzbieri)'. All three Scandinavian individuals were diagnosed as abietinus in the hand, with Petteri Lehikoinen commenting re the Finnish bird that this was supported by biometrics and call as well as location. Plate 7. Three images of 'grey and white' Chiffchaff P. collybita, Scilly, Oct 2011. Compare with three examples of 'grey' Scandinavian Chiffchaffs P. c. abietinus in Plate 8. Plate 8. Three examples of relatively 'grey' Scandinavian Chiffchaffs P. c. abietinus. Compare with 'grey and white' Chiffchaff, Scilly, Oct 2011, in Plate 7. The Scandinavian Chiffchaffs, diagnosed as abietinus in the hand, clearly differ from typical nominate collybita, being evidently greyer and less-colourful. Compared with the 'grey and white' Chiffchaff from Scilly, the Scandinavian individuals have slightly more yellow on the underparts and in the upper eye-ring and fore-supercilium. Yet, despite rather different ambient light, in their general appearance the St Agnes Chiffchaff and the Scandinavian Chiffchaffs are evidently similar in key respects and are clearly 'cut from the same cloth'. All four exhibit limited olive and yellow compared with nominate collybita and have an evident 'neutral' or 'stony' grey component to the ground-colour of their upperparts. Their plumage hues share a common palette, which lacks entirely the tan-brown hue which characterises the upperparts of classic tristis. The appearance of the St Agnes individual (and the others in Plate 5) converges far more closely with the Scandinavian abietinus than with definitive examples of tristis (e.g. plate 2). Set against the list of criteria for classic tristis near the start of this item, grey-and-white 'Bonelli's-like' Chiffchaffs, such as the St Agnes individual, fail on nearly all counts. It is only their 'paler' and less-colourful plumage which provokes thoughts of tristis. In forum-based and Europe-wide debates on the identity of 'greyer' Chiffchaffs, a level of disagreement can be attributed, no doubt, to which taxon is the day-to-day norm for contributors. A Chiffchaff described as 'evidently grey' and 'striking' by an observer based in the UK (for whom collybita is the norm) might be considered less remarkable by an observer based in Fenno-Scandia (for whom abietinus is the norm). Following the publication of de Knijff et al., 2012, the 'prior image' of abietinus among observers for whom collybita is the norm has swung away from a paler and less colourful taxon than collybita and towards a taxon which is indistinguishable in the field from collybita. The emerging evidence is that, in fact, the plumage limits of abietinus are not confined to either of these preconceptions but embrace both. Ticehurst (1938) and Svensson (1992) each indicated just this level of variation (see opening paragraph of this section). Uku Paal very kindly supplied a portfolio of photos of Chiffchaffs he has trapped in Estonia and, among these, several display a decidedly grey and non-collybita-like livery when considered from a UK perspective. Another example is shown below in Plate 9. The 'grey and white Bonelli's like' Chiffchaffs clearly converge with abietinus rather than with tristis. Further photos of the Scilly 'grey and white' Chiffchaff, together with images of a very 'brown and buff' tristis present at the same time, can be found in the case-study here, where the issue of 'plumage morphing' is also addressed. Further images of abietinus, including several 'grey' individuals, can be found on the Finnish 'BirdLife' website. Dean & Svensson (2005) suggested that 'greyer' Chiffchaffs may not all have a single origin. They noted that options to be considered included individual variation among all the races, greyer examples of both abietinus and tristis and hybridization between these two forms ('riphaeus' types - see Appendix 3). They also discussed the possibility of Chiffchaffs in some part of the range consistently combining greyer livery with a tristis-like call. Such Chiffchaffs do exist, in the SE of the species' range. While not currently established as reaching western Europe, a comprehensive approach will include the appearance and calls of more-southerly races. The taxonomy of Chiffchaffs breeding in the Middle East and the Caucasus is debated, with brevirostrsis, caucasicus and menzbieri having been included historically within abietinus (and the last also within tristis / 'fulvescens'). It has been suggested that Turkish breeding brevirostris, generally conveyed as a relatively brown subspecies, in fact span the plumage features of collybita and abietinus, e.g. Copete & López (2013) while these authors and Shirihai & Svensson (2018) have questioned whether some of the southern forms warrant division from abietinus. However, in certain parts of this region, individuals are evidently greyer above and whiter below compared with typical abietinus and have very little yellow on the underparts (e.g. in parts (at least) of the Caucasus, where the form is caucasicus under current taxonomy, and in northern Iran (pers obs) where the form involved is either caucasicus or menzbieri, probably the latter - see recent genetic studies by Raković et al. 2019). Additionally, the southern forms have calls which are relatively 'flat' and resemble the call of tristis rather than abietinus / collybita. See <here> for examples from the Elborz Mountains in Iran. Such individuals confirm that Chiffchaffs with a relatively 'grey and white' livery are a reality and may have calls which resemble closely the standard call of Siberian Chiffchaff. While it is generally assumed that these southern taxa would be unlikely to reach western Europe, experience teaches that such assumptions may be unwise. Were greyer Chiffchaffs from this region to reach western Europe, then - combining relatively grey upperparts and rather white underparts with a tristis-like call - they would clearly create an identification pitfall. As well as restricted olive and yellow in the plumage of tristis, the importance of their characteristic 'tan-brown and buff hues is once again highlighted. In summary, 'whole genome sequence data' is required for : (a) abietinus of known provenance and wide distribution, to clarify the plumage limits of thoroughbred individuals; (b) 'grey and white' Chiffchaffs encountered on migration in western Europe, to establish to which taxon or taxa they belong. Call will certainly provide invaluable guidance when identifying Chiffchaff taxa, at least when an individual calls frequently and with a consistent call. However, many candidate tristis call infrequently (even not at all) while call will not exclude the possibility of hybrid origin. Also, 'alternative' and 'plastic' calls of collybita / abietinus may simulate or suggest the standard call of tristis and vice versa and it is now clear that such calls are not confined to juveniles in the immediate post-breeding period, as has been claimed in the past. Some individuals combine 'variant' calls with plumage anomalies and thereby raise further questions about their genetic origins. Adding to these complexities, there have been several instances of Chiffchaffs with plumage features associated with tristis yet calling persistently like collybita/abietinus. During the winter 2013/2014, several such individuals were photographed and/or video'd and also sound-recorded, placing their combination of plumage and call beyond question (see 'Case Study 3'). Earlier assertions that calls are a failsafe guide to distinguishing Chiffchaff taxa, and render detailed plumage evaluation unnecessary, are now shown to be misguided. Diagnosis must always be founded on a careful evaluation of both plumage and vocalisations. The topic of vocalisations is examined in more detail below. The characteristic call of tristis ► (here recorded in Russia) is a near-monosyllabic ‘eeep’ (or ‘iiihp’ in Scandinavian renditions), predominantly even in pitch but descending and fading slightly at the end, which produces a plaintive and slightly 'off-key' quality. In sonogram, note predominantly even pitch ('flat' and horizontal trace) with just a slight downturn at the end. The cd 'Calls of Eastern Vagrants' (Jännes 2002) also includes a particularly good and monotone example, recorded in the wintering grounds in India. The sound recalls a less sibilant and less 'tinny' version of a Dunnock's call or a higher-pitched less piping variation of a Bullfinch's call. This call is very different from the normal, distinctly rising ‘hüit’ of collybita and abietinus, and is an important component in any identification of a potential tristis. The song of tristis ► (here recorded in Russia by Antero Lindholm) is a fluent warble of closely-spaced and near-disyllabic notes. Sonograms of the song show characteristic notes with ascending modulations, which are absent from the typical song of collybita and abietinus. These ascending and disyllabic-sounding notes generate a characteristic rising and falling character, much more varied and liquid than western chiffchaff song. A typical sequence might be transcribed as: ‘chivvi-tee, chooee, chivvi-tee, chooee-tee, chivvy’. While tristis song does contain occasional notes with a descending pitch overall (and which can recall abietinus/collybita notes in structure), such notes are in a minority and are absent entirely from some tristis songs (and perhaps from the repertoire of some individuals). Also, they often start with a short rising element and have a distinctly narrower bandwidth than true abietinus/collybita notes. See discussion in Lindholm (2008) for details of note structure in the songs of abietinus and tristis and also a comprehensive examination of 'mixed singers'. Although adults of all races have 'standard' contact calls, which they employ consistently under most circumstances, there are also so-called 'plastic' and 'alternative' calls. Such variant calls are employed regularly by juveniles in autumn while, in the cases of collybita and abietinus at least, alternative calls are also employed by adults under certain circumstances and in certain years (for reasons which are not yet understood). So-called 'plastic' calls are associated with juveniles which are deemed to be learning their calls. At this early stage, collybita may give a call which is very reminiscent of tristis, being both even in pitch and monosyllabic. Here ► is a composite recording which includes, first, a juvenile collybita (Warks, July 2013) and then a tristis (Warks, January 2013). 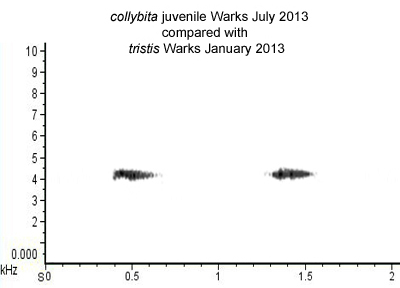 In such direct comparison, the call of the juvenile collybita is marginally less even and rather more 'fuzzy', less 'pure', than the tristis call but they are in general rather similar. Below is a sonogram comparing the pitch and structure of the two calls (Fig. 2.). See also 'The Sound Approach to Birding' (Constantine & The Sound Approach, 2006), page 91, and listen to the call at 0:16 - 0:18 in their recording of Common Chiffchaff on CD1 track 86. It is sometimes claimed that such 'plastic' calls are unlikely to be heard after early September, well before the arrival time in western Europe of tristis. However, it is now known that 'plastic' calls can persist into November, at least. Although rarely as similar to tristis as the 'plastic' call illustrated above, confusion can also arise between the classic call of tristis and 'alternative' calls given at times by abietinus and collybita at any time of the year. Such 'alternative' calls are very different from the standard, rising ‘hüit’ or 'hweet' call and can easily lead to confusion. Among documented 'alternative' calls, perhaps the most frequent reference is to a call usually transcribed as 'sweeoo', which rises then falls rather sharply in pitch, creating a disyllabic sound, while the sonogram has the shape of a circumflex or an inverted 'V'. It can recall one call of Thrush Nightingale Luscinia luscinia. This type of call has been associated with 'eastern abietinus' (see for example Jännes 2002) but such a call is also to be heard from collybita and western abietinus, at any time of the year but especially during the late summer and autumn. They have been heard even during the winter in the UK (pers obs) and also in Spain, from birds with the appearance of western forms (Copete & Armada 2004). Additionally, in some years they have been heard commonly in spring from adults, in the UK and elsewhere in Europe (see separate article on this topic). Despite the disyllabic quality, the fact that the 'sweeoo' type of call is rather abrupt, and has start and end frequencies which are closer than in the evidently rising 'hweet' call, means that even well-inflected 'sweeoo' calls can have a 'flatter' sound than the familiar 'hweet' call. In such a direct comparison, the 'alternative' call of collybita is quite abruptly and strongly inflected and has a 'brighter' timbre, while the call of tristis is straighter and is more plaintive and slightly 'off-key'. However, it is easy to understand how the two might be confused when heard in isolation, at distance, or by someone not thoroughly familiar with the call of tristis. Conversely, not all calls given by tristis and/or 'fulvescens' match the ideal or classic 'straight' structure described above. Calls attributed to tristis may also have a clear rise and fall in pitch on occasions, and could be transcribed as a shallow 'sweeoo' rather than a truly evenly-pitched and monosyllabic 'eeep' or 'iiihp'. Here is a composite recording ► which compares two calls attributed to tristis: a classic, straight 'eeep' call from Russia and a shallow 'sweeoo' call from India. A sonogram of the two calls is below (Fig. 4). Generally, compared with the 'sweeoo' calls of collybita and abietinus, the shallow 'sweeoo' call of tristis / 'fulvescens' has a much more gentle transition from rising to falling pitch and a distinctly 'shallower' frequency range and lower peak frequency. The sonogram has the shape of a shallow inverted 'u' rather than an inverted 'V'. See Antero Lindholm & Anneka Forsten's website for a variety of such calls. Here is a composite recording ► which compares a 'sweeoo' call given by a nominate collybita in Warwickshire in July 2011 (my own recording) with a 'sweeoo' call given by a tristis / 'fulvescens' in India in December 2007, recorded by Antero Lindholm. A sonogram of the two calls is below (Fig. 5). 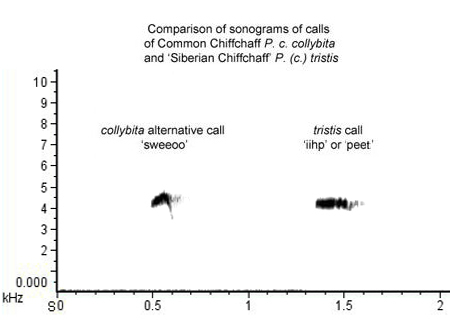 This direct comparison and the sonograms illustrate the relatively abrupt transition of the collybita call and the smoother transition of the tristis / 'fulvescens' call, together with the differences in peak frequency and frequency range, which create a different timbre. Yet, both are clearly ‘sweeoo’ calls to the ear and could well be confused if heard in isolation or in the imperfect acoustic conditions which will generally attend field encounters. 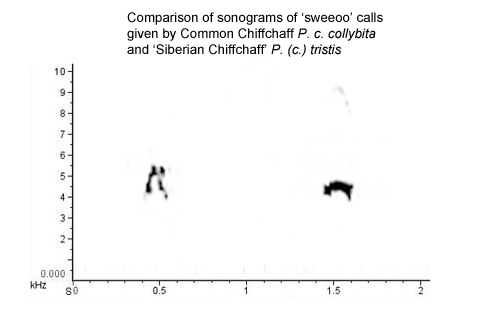 For example, listen to the recording and examine the sonogram of an abietinus/collybita style 'sweeoo' call given by a 'mixed singer' Chiffchaff in Warks in March 2014). The vocabulary of other forms of Chiffchaff is varied and tristis is unlikely to provide an exception. Listen here ► and here ► to series of recordings from October 2009 by Maarten Wielstra, involving a Chiffchaff in the Netherlands which looked and sang like tristis. Some of the calls in the series are decidedly different from the classic, evenly-pitched 'iiihp' or 'eeep' call of tristis. Alternative calls themselves vary, with some 'sweeoo' type calls given by collybita and abietinus being truncated and less-emphatically inflected, thus resembling the 'plastic' calls of younger juveniles and converging with the shallow 'sweeoo' call given by some tristis (both readily sounding more like a monosyllabic 'swee'). Some individuals give such calls persistently. The indications are that 'sweeoo' type calls can be given by all forms of Chiffchaff and provide the most evident case of call convergence. As well as the regularly encountered 'standard' and 'alternative' calls, Chiffchaffs of all taxa occasionally utter 'wayward' or 'eccentric' calls, which differ from the established calls which are employed more systematically. As these too may sometimes suggest the standard calls of another Chiffchaff taxon, they must also be considered when encountering an anomalous call. Generally, such 'eccentric' calls will not be used persistently and will also lack consistency in their structure and 'sound', while 'standard' calls will also be interspersed in 'eccentric' call-sequences. The calls of Chiffchaffs encountered in Turkey (brevirostris) and, especially, in the Caucasus (caucasicus) are relatively flat and may resemble or even match the typical call of tristis (Copete & López 2013; Lars Svensson in litt., and see for example Dubois & Duquet 2008). The little-known form breeding in NE Iran and Kopet Dagh in Turkmenia (menzbieri) also has a 'flat' call with a limited frequency range. The taxonomy of these forms is still debated. Currently, they are accorded subspecific rank but, historically, they have also been subsumed within abietinus (and menzbieri sometimes with tristis / 'fulvescens'). Copete & López (2013) reported that morphologically brevirostris could not be distinguished from collybita and abietinus (at its western and eastern boundaries) which suggests that call alone provides its differentiation. When visitors from Europe first encountered such individuals in the Middle East, they were assumed to be abietinus and to include migrants heading for eastern Europe. This lead to statements that the typical call of 'eastern' abietinus was a tristis style call (as repeated by e.g. Dean 1985). However, it is now appreciated that such calls are the standard call of more southerly forms of Chiffchaff and not of more easterly examples of abietinus. As far as is known, the latter has the same call repertoire across its European range, though the taxonomy of the southern forms is still under review. For an example of calls given by Chiffchaffs breeding on the lower slopes of the Elborz Mountains in Iran see <here> and for enigmatic Chiffchaffs wintering in Kuwait see <here>. The paragraphs above relate primarily to calls used by Common Chiffchaff which can cause confusion with the typical call of tristis. An even more perplexing issue involves Chiffchaffs with plumage features associated with tristis/'fulvescens' yet persistently employing fully-crystallized collybita/abietinus calls. These have not been isolated, hesitant calls with the character of 'plastic' calls but prolonged series of fully-developed collybita/abietinus calls. Several of these individuals occurred in Britain during the winter of 2013/2014 and were observed over several weeks. They used such collybita/abietinus calls persistently and not as a fleeting departure from the typical tristis call. Are such anomalous callers the result of cultural call 'copying' among perceived competitors (and if so what does it imply about their geographical origins) or do they have a genetic origin? Song anomalies have been associated with genetic admixture (see Shipilina et al. (2017). Do call anomalies have a cultural origin or are they too a sign of genetic introgression? This intriguing issue is explored further, with examples, in 'Case Study 3'. None of this should undermine the significance of the classic tristis call, which still provides an important element in identification. However, to regard call as an unfailing key is over-simplistic and diagnosis of tristis should always embrace both vocal and plumage features. 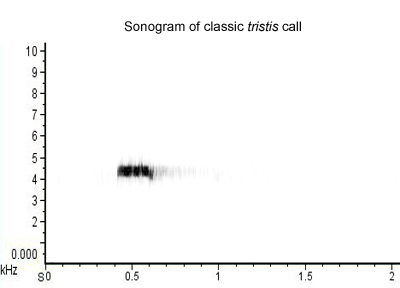 The classic evenly-pitched, monosyllabic and somewhat mournful call of tristis ('eeep' or 'iiihp', with a flat shape in a sonogram, thus: ) is a strong indicator of taxon but it is essential that the call is heard clearly and that the observer is thoroughly familiar with the call of tristis. Ideally, the call should be confirmed by sound recording and sonogram. The normal call of collybita and abietinus is a 'bright' and rising 'hweet', quite different from the standard call of tristis. However, so-called 'alternative' calls are also given regularly and consistently by collybita and abietinus and have a rising and falling frequency and a rather disyllabic sound, usually transcribed as 'sweeoo'. Despite their disyllabic quality, such calls are rather abrupt and the fact that their start and end frequencies are close means that they can have a 'flatter' sound than the familiar, rising 'hweet'. Correspondingly, such calls can be confused with the classic, straight tristis call. Emerging evidence suggests that the call of tristis does not invariably match the idealised, evenly-pitched and monosyllabic 'eeep' or 'iiihp' but may rise and fall in frequency slightly. Thus, tristis too may use a 'sweeoo' variant call, though this is shallower than the 'sweeoo' call of abietinus/collybita. The transition from rising to falling pitch is usually more gradual (less abrupt) than in collybita/abietinus, the peak frequency is lower and the frequency range narrower (more compressed). Thus, in a sonogram, the shapes of the calls recall a shallow inverted 'u' for tristis and an inverted 'v' for collybita/abietinus (i.e. ). Thus, there is some convergence in structure and 'sound' between such variant 'sweeoo' calls, with a 'two-way' potential for confusion. A recording and sonogram will provide structural clues but, clearly, attributing such calls to a given taxon by ear alone can be problematic. Chiffchaffs of all taxa will occasionally employ 'eccentric' calls which may suggest the standard call of another Chiffchaff taxon. Generally, such calls are used intermittently, or the call-structure lacks consistency, so that prolonged listening and recording will reveal its 'eccentricity'. More perplexing are occasional individuals with plumage traits which are associated with tristis (e.g. a deficiency of yellow and olive in the plumage) yet employ persistent series of perfectly formed abietinus/collybita calls. Some have proved additionally to be 'mixed singers' (see Case Study 3'). A cultural origin has been suggested for such vocal anomalies (leading to one taxon 'copying' from another) but studies of tristis and abietinus in their sympatric zone have revealed an origin in genetic admixture (see Shipilina et al. (2017). Although their occurrence in NW Europe is not established, it should be borne in mind also that the calls of the more southerly forms brevirostris, caucasicus and menzbieri can be similar or even indistinguishable by ear from that of tristis (Lars Svensson & José Luis Copete in litt. ; pers obs). These examples of variant, anomalous and convergent calls illustrate the importance of assessing both vocalisations and morphology of any candidate 'Siberian Chiffchaff'. In 2007 the BBRC co-opted a 'tristis panel' to examine all reports of 'Siberian Chiffchaff' in the UK during the 'sample' year of 2008. The panel examined all individuals using the traditional 'Svensson criteria' for classic tristis, while taking into account the form's characteristic 'tan-brown and buff' hues. Also, allowance was made for individuals which were clearly very like 'classic tristis' but exhibited very limited 'fulvescens' characters (generally imperceptible in the field and often detected only in good, close-up photographs). To insist on an absolute absence of 'additional' yellow and olive would, in effect, exclude field identification of tristis completely, as the absolute absence of these 'misplaced' hues can only be confirmed in the hand. To exclude field identifications would, in turn, undermine the objective of establishing a measure of the true status of Siberian Chiffchaff in Britain. Further, as discussed above and in the Appendices, individuals with very slight 'additional' yellow and olive (i.e. with limited 'fulvescens' traits) are compatible with chiffchaffs from the West Siberian Plain and beyond the true zone of overlap with abietinus. Although there may be slight introgression across the West Siberian Plain, the panel concurred with the suggestion by Ticehurst (1938) and by Lars Svensson (in Dean & Svensson 2005) that individuals with such restricted 'fulvescens' traits are best incorporated with tristis (though with no formal taxonomic implications in the term 'fulvescens'). Conversely, 'riphaeus'-like individuals (with more evidently intermediate plumage), individuals with anomalous calls, and 'Bonelli's-like' grey-and-white individuals (sensu Dean & Svensson 2005), were excluded by the panel's criteria, as the origins of such individuals remained equivocal. While questions remain to be answered, a clearer picture of the status of tristis (here including 'fulvescens' sensu stricto) in the UK emerged. Full details were published in: Dean, A., Bradshaw, C., Martin, J., Stoddart, A. & Walbridge, G. 2010. The status in Britain of 'Siberian Chifchaff'. British Birds 103: 320-338. The panel's investigations demonstrated that the 'Siberian Chiffchaffs' meeting these criteria reach Britain in significant numbers. For 2008, reports of 57 individuals were submitted to the panel, of which 49 (86%) were accredited. Applying this endorsement rate to all known reports in Britain during 2008 suggested that around 120 Siberian Chiffchaffs may well have occurred during the year. Thus, Siberian Chiffchaff was confirmed as a scarce rather than rare visitor, a conclusion confirmed by analyses for subsequent years that have been published in the 'Report on Scarce Migrants' published periodically in British Birds. The tristis panel's report also examined in detail the issues of morphology, vocalisations, genetics and hybridization (as known at that time); the seasonal and geographical distributions of Siberian Chiffchaffs reaching Britain; comparative data from other European countries; and the numbers of Siberian Chiffchaffs reaching Britain in comparison with those of Yellow-browed and Pallas's Leaf Warblers. Reference should be made to the panel's publication by anyone wishing to explore the topic further. Following the finding by Shipilina et al. (2017) that, in the sympatric zone, even tristis morphotypes carrying tristis mtDNA may yet harbour 'mixed alleles', the proviso now is that the majority of tristis types reaching teh UK and western Europe must originate from beyond the sympatric (and hybrid) zone. This may seem a reasonable assumption a priori must has yet to be demonstrated conclusively. A 'case-study' from Warwickshire, involving three individuals, one with evidently different appearance and some 'fulvescens' traits. For much useful discussion, information, clarification and / or provision of excellent photos, I am indebted to Niclas Backström, Staffan Bensch, Colin Bradshaw, Martin Cade, Richard Chandler, Martin Collinson, Greg Conway, José Luis Copete, Gary Crittenden, Philippe Dubois, Martin Garner, Dave Hutton, Gabriel Jamie, Hannu Jännes, Magnus Hellström, Robin Hemming, Peter Kennerley, Mike Langman, Paul Leader, Petteri Lehikoinen, Antero Lindholm, Vladimir Loskot, Irina Marova, John Martin, Richard Millington, Steve Nuttall, Martyn Pitt, Jelmer Poelstra, Roger Riddington, Kees Roselaar, Steve Seal, Daria Shipilina, Brian Small, Andy Stoddart, Lars Svensson, Pavel Tomkovich, Chris Turner, Grahame Walbridge, Andy Warr and Maarten Wielstra. Mark Adams kindly arranged access to the skin collection at NHM, Tring. It is intended to keep the contents updated as new information emerges. Thus, any citation should include the date on which the text was consulted.